Friedman does not stop there. 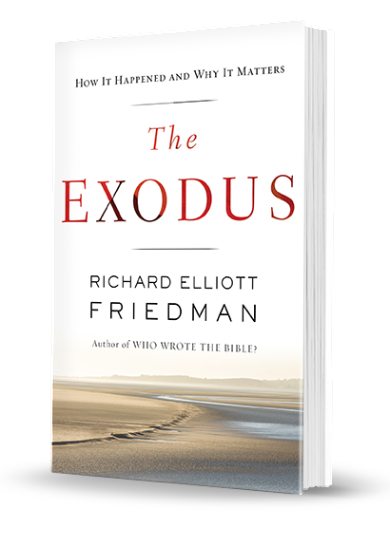 Known for his ability to make Bible scholarship accessible to readers, Friedman reveals how much is at stake when we explore the historicity of the exodus. We learn that it became the starting-point of the formation of monotheism, the defining concept of Judaism, Christianity, and Islam. Moreover, we learn that it precipitated the foundational ethic of loving one’s neighbors — including strangers — as oneself. He concludes, the actual exodus was the cradle of global values of compassion and equal rights today. Richard Elliott Friedman is one of the premier bible scholars in the country. He earned his doctorate at Harvard and was a visiting fellow at Oxford and Cambridge, a Senior Fellow of the American Schools of Oriental Research in Jerusalem, and a Visiting Professor at the University of Haifa. He is the Ann & Jay Davis Professor of Jewish Studies at the University of Georgia and the Katzin Professor of Jewish Civilization Emeritus of the University of California, San Diego. He is the author of Commentary on the Torah, The Disappearance of God, The Hidden Book in the Bible, The Bible with Sources Revealed, The Bible Now, The Exile and Biblical Narrative, and the bestselling Who Wrote the Bible? He was an American Council of Learned Societies Fellow and was elected to membership in The Biblical Colloquium. His books have been translated into Hebrew, German, Italian, Spanish, Russian, Japanese, Polish, Hungarian, Dutch, Portuguese, Czech, Turkish, Korean, and French. He was a consultant for the Dreamworks film “The Prince of Egypt,” for Alice Hoffman’s The Dovekeepers, and for NBC, A&E, PBS, and Nova.